9 Facts About Vulture! ~ CK Jacob: Nigerian Fiction And Lifestyle Blog. I don't like vultures. They are ugly! There are 23 species of "vultures": 16 Old World vultures found in Africa, Asia, and Europe, and seven New World vultures in America. Old World vultures do not have a good sense of smell – they rely exclusively on incredible eyesight to locate food – a soaring vulture can spot a 3-foot animal carcass from 4 miles away! 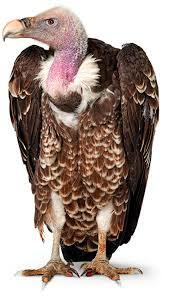 Vultures can eat up to 20 percent of their own body weight in one sitting. Vultures are equipped with a digestive system that contains special acids that will dissolve anthrax, botulism, and cholera bacteria. Vultures do not go after healthy prey, but will attack wounded and dying animals. New World vultures have the unusual habit of urohydrosis, or defecating on their legs to cool them evaporatively. The bald, or lightly-feathered, head is specially designed to stay clean even when confronted with blood and bodily fluids present in the carcasses. Any remaining germs are baked off by the sun. Oh wow! Amazing facts. Not of a fan of vultures though.